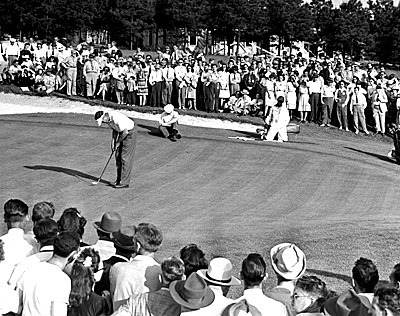 Playing the first post-war Masters, Herman Keiser and Ben Hogan both three-putted the 72nd hole to allow Keiser to win by one stroke. The Masters wasn't played in 1943, 1944 or 1945 because of World War II. 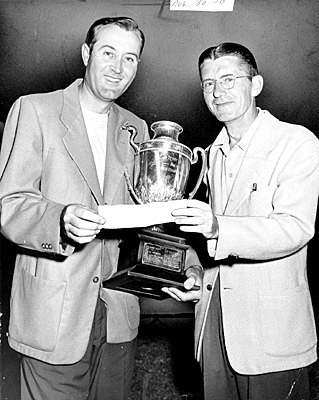 Which made the 1946 Masters the first one in four years. The winner was Herman Keiser, who himself spent most of the years of 1942-45 in the United States Navy during World War II. Keiser took a 5-stroke lead into the final round and nearly gave it away. When Keiser 3-putted the last green, he fell into a tie for the lead with Ben Hogan, who was playing a couple groups behind Keiser. Hogan, still looking for his first win in a major, reached the 72nd green still tied. But then he, too, 3-putted, giving Keiser the 1-stroke victory. Hogan could have forced a playoff by making a 2-foot par putt, but he missed.